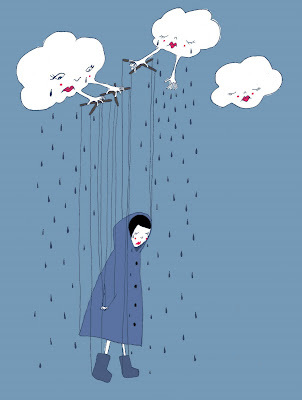 Seasonal Affective Disorder (SAD) is a very real and common winter phenomenon. Historically we have called it the “winter blues” or “cabin fever”. Lack of sunlight hours in the winter months have a very strong and real impact on our physiology and contribute to SAD for a multitude of reasons. The farther north one lives, the more likely one is to drive to work or school in the dark, sit in a building all day with artificially lighting, then drive back home afterward in the dark. Just thinking of that is a little depressing! I grew up in Alaska and experienced severe seasonal affective disorder from the age of 14 until I moved away at 22. It is what prompted me to get involved in exercise as I found vigorous activity to offer some relief from very debilitating depression. There were months where I saw very little to no sunlight because it was too cold to be outside or I would be sitting in windowless classrooms all day. Those of you who know me personally know I have a fairly strong response to cold, wintery behavior. This is partially in response to associating winter with such extreme emotional despondency. At the time, all that was offered as a remedy was the new and exciting SSRI’s that Eli Lilly and other companies were manufacturing. I tried most of what was available back then at least once with varying degrees of relief. Initially, I would like to say that a decrease in energy and vigor in the winter is PERFECTLY NORMAL. The world around us – plants and non-migratory animals – go into a state of dormancy or hibernation. Like them, we are an integral part of this cycle. Winter is a time of rest and reflection so that we have the reserves required for spring and summer’s bustle of activity. Before Edison brought us the light bulb, days ended earlier and nights consisted of stories, knitting, or card games by fire or candlelight. In our disconnection from nature’s cycles we have asked our body to continue with high productivity month after month and year after year. Our rest comes in the form of sick days and paid vacations. It is out of rhythm with the greater cycle we live in. This is, I believe, part of the reason why this condition has become both so prevalent and so debilitating. Light Therapy: Sunlight affects our mood and energy by encouraging production of both melatonin and serotonin through messages sent from the retina to the brain. “Light boxes” simulate the intensity of sunlight on a clear spring day and can help normalize mood and sleep. I’ve also had clients benefit from dawn simulators to help with waking up in the morning. Taking Breaks during daylight hours: If you work in an environment which has little access to natural light, be sure to get out for 10-20 minutes a day while the sun is still up. It’s amazing how much of a boost a brisk walk can do mid-day. Get thee to thy local gym! If the weather is too crummy to be outside, get into the gym for three hours a week. The time you take for this will be returned in increased productivity, better moods, and decreased illness. Lift weights, watch the news while taking a brisk walk on the treadmill — just get your heart pumping and your blood moving. If you need accountability an experience, certified personal trainer or get an exercise buddy can help you out. If you are more internally motivated, post a visual representation of what happiness means to you in a place you will see daily. Omega-3’s: A natural part of many diets in far-northern countries are high-doses of omega-3 fats from marine life. Cultural and laboratory studies demonstrate marked improvement from or absence of depressive symptoms when high doses of omega 3 fatty acids are consumed regularly. Dosage is dependent on symptoms; speak to a health professional knowledgable in nutrition and brain health for your specific needs. Expect Less of Yourself: This has been my most recent change and has really made a difference. Knowing that I am not separate from the natural world around me has given me permission to slow down a bit from November through February. I do not expect as much from myself, I do not push myself and I allow more time for soothing, restorative activities: cooking, reading, having tea with loved ones, sleeping in a little more on weekends, and so on. Traditionally a Type A, this shift has taken some time to embrace but now that I have there is less struggle and stress in the winter months. Keep your appointment book a little more open for downtime, get a massage, sit in a cafe with a friend you’ve been dying to catch up with and re-connect. Monitor Yourself: Keep tabs on how you are doing. If you are trying to wean off of medication, make sure you have professional support to ensure a smooth transition. If you find that coming off of medication is not an option, the above suggestions can still be of benefit to you. Implement them as a means of not just surviving SAD, but moving through the season gracefully and pleasantly. You are not alone; upwards of 10% of northern populations experience symptoms. If you find your symptoms are severe, please shore up support from loved ones, have a quality mental health professional on speed deal, and make a contract with others to reach out if things become too much. You are more valuable and loved than you can possible imagine. I’d love to hear about your own personal experience with the winter blues and how you have worked with this season to stay happy, whole and healthy. Your ideas and suggestions may offer relief to someone struggling. Please comment below and share your experiences. This post has been updated and republished in loving memory of Stacy Aviva Solomon. You will always be cherished and missed.